Needing photographs of the Southern Uplands and the Black Mount in the Central Highlands for a forthcoming Cicerone Press Scottish Mountains book I decided to combine a trip to the two areas, despite the distance between them. Then it was a matter of waiting for the likelihood of several days of good weather. This arrived this last week so I duly set off for Glen Etive where I walked into the long, narrow and steep-sided glen of the Allt Coire Ghuibhasan. As darkness fell I was happy to find a small patch of flattish ground down by the stream for the tent. At the time I was just looking for anywhere that might make a comfortable camp before it grew too dark to see. 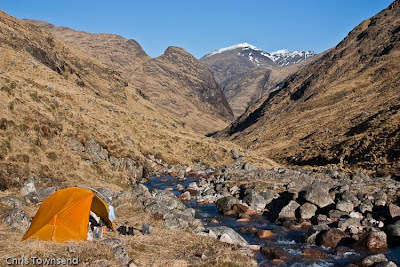 The next day I looked out of the tent and down the rugged glen to the snowy peaks of Bidean nam Bian and realised I’d chosen a spectacular site. The next day was spent following the long spine of the Black Mount from Stob Gabhar to Creise, a superb high level walk with tremendous views. Above 900 metres there was still almost total snow cover and the mountains felt alpine. The brightness of the sun and the glare from the snow made for an alpine feel too. The mountains shone in the spring light. A second night in camp then it was down to the car and the long drive south to Moffat Dale. The sunny weather had me stopping many times before I left the Highlands for photographs of Rannoch Moor, Crianlarich, Ben Lomond and more. The Green Welly Stop in Tyndrum provided a nice lunch. The stops and the leisurely drive meant I reached Glasgow just in time for the rush hour and a tedious forty minutes stationary or at 5mph on the city motorway. Even when free of the congestion the motorway was crowded and I left it for Moffat with relief. The narrow winding road down Moffat Dale had little traffic and I reached the Grey Mare’s Tail car park more relaxed than I expected. Taking the opportunity of two trips in one to test various items of gear I set off with a different pack, tent, pair of boots, waterproof clothing and other items than those I had used just that morning. The Black Mount suddenly seemed far away in time as well as distance. But here I was heading up into the hills in the dusk again and feeling relieved when I found a little flat spot amongst the heathery knolls above Loch Skeen. 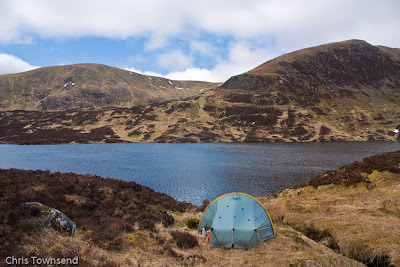 The scenery isn’t as spectacular here as in the Highlands but it was another fine site, as I found when I woke to a view across the loch to White Coomb. The hot sunshine of the north had given way to cooler weather with a sharp east wind and I walked fast round the hills above the loch. Back at the tent by early afternoon with photos taken and walk done I decided to head home via Edinburgh, a longer route but with less time spent on motorways and the opportunity to stop at St Mary’s Loch and then in Galashiels for supper. Approaching Edinburgh I watched a deep red sun setting behind the Pentland Hills, its colour maybe enriched by the volcanic ash from Iceland. In the early hours of the morning I reached home under a brilliant starry sky. Photo info: Both photos Canon EOS 450D, Canon 18-55 IS lens, raw files converted to JPEG in Lightroom 2.6. Top photo: Camp in Coire Ghuibhasan, the Black Mount, 30mm, 1/500@ f5.6, ISO 100. Bottom photo: Camp by Loch Skeen in the Tweedsmuir Hills, 18mm, 1/50@f5.6, ISO 100. You could be right! Actually I'm thinking of a comparison single hoop tents in general - Akto, Scarp, Power Lizard, Laser, Eden. That would be very interesting. Have you seen the mods that I've made to my Scarp? In particular, you might want to try the threshold cord, which takes the strain off the door panel. Same goes for the Laser Comp and may even be a good idea on the Power Lizard. The Akto already has one, which was what gave me the idea. So far I'm very pleased with the Scarp. I was amazed at how much less condensation there was on three cool still nights in N. Wales compared to my experiences of the Akto and LC. Yes, I've seen your mods. They are interesting and I might apply some of them. For published tests I need to review tents as supplied of course, though I can suggest changes. I don't think a threshold cord is needed with the Scarp 1 but it would be a very good idea for the Power Lizard. The Scarp 1 does have much the best ventilation options of single hoop tents. However there was copious condensation inside at the Loch Skeen camp despite both inner and outer doors being open and there being a breeze. Humidity was 100%. It's easy to avoid pushing the inner against the outer in the Scarp of course so my down bag and the rest of my gear stayed dry. Loch Skeen looks superb walking terrain. I see you have the new Scarp Flysheet. What do you think as a first impression vs the old one? Martin, yes, the Tweedsmuir hills around Loch Skeen are excellent for walking. The new Scarp flysheet definitely keeps the wind out better and pitches more tautly than the original. It's made a very good tent even better. Loch Skeen one of my favourite walks, starting from the Talla. Nice and easy but with great views. It was superb, Mike, and I was lucky, given that I found it after dark. 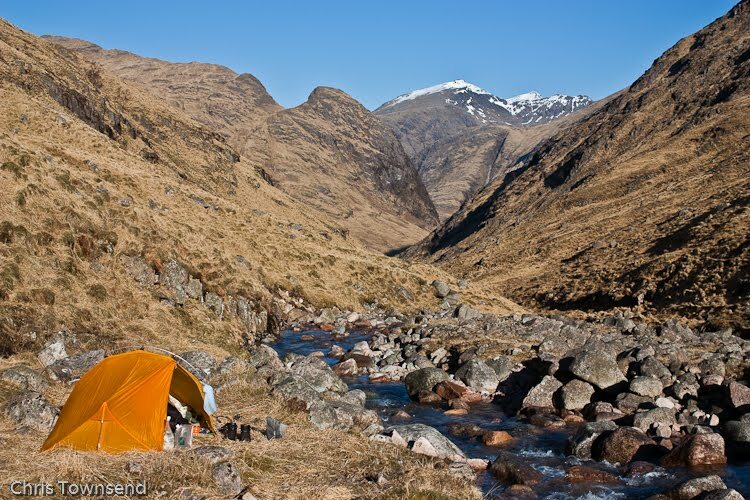 loving that camping spot in glen etive. i think i may well go to the exact spot next week! Great to read that you've been down Loch Skeen way. The reveal as you almost stumble onto it is spectacular. I used to bemoan living in Edinburgh (and now just outside) as it always seemed just an hour or two too far from the Highlands. However, since discovering the Borders and Galloway in the past 18 months, I have come to love walking in this area - and it's no more than an hour from home.